Paris (AFP) – France’s “yellow vests” took to the streets on Saturday for a 10th straight weekend of anti-government protests, despite attempts by President Emmanuel Macron to channel their anger into a series of town hall debates. The president, who was caught off guard when the protests began late last year, went on the counter-offensive this week, spending hours in rural France debating with disgruntled mayors. But tens of thousands of yellow vests refused Saturday to demobilise. In Paris, several thousand people, many waving placards calling for Macron to resign or condemning police violence, marched through the Left Bank in freezing temperatures. “Parisians, rise up!” they chanted, urging residents of the capital to join the movement which has been led by rural and small-town France. The rally in Paris — as well as those in Rennes, Toulouse, Lyon and several other cities — ended in sporadic clashes, with police using tear gas and water cannon to disperse hooded protesters who threw paving stones and bottles. But for the second consecutive week there were no signs of the chaos and destruction seen over several successive weekends in the capital. Turnout was closely watched for signs of possible fatigue in the movement as it enters its third month and Macron’s “great national debate” gains momentum. The interior ministry estimated the number of protesters at 27,000 by the early afternoon, down from 32,0000 at the same time a week ago. Some 80,000 police were deployed to keep the peace. “Police everywhere, justice nowhere,” protesters in Toulouse chanted. By giving the protesters a forum to debate their grievances Macron hopes to lure them off the streets. This week, he kickstarted two months of nationwide discussions on issues ranging from taxation to public services, spending over 12 hours debating with mayors in the north and southwest of the country. Michel, a stocky 53-year-old computer engineer from the Paris suburbs, who returned to the capital Saturday for his ninth demonstration in as many weeks, said he would boycott the discussions. “It’s over. We’re divorcing our elites and there can be no getting back,” the father of three, who did not wish to give his full name for fear it could cost him his job, told AFP. Macron was elected at the head of a grassroots movement that went door-to-door asking the French what kind of changes were needed. But once in office he adopted a top-down approach more in keeping with that of post-war president Charles de Gaulle. A prodigious debater, he vigorously defended his reforms in this week’s town hall meetings but assured he was open to making adjustments. 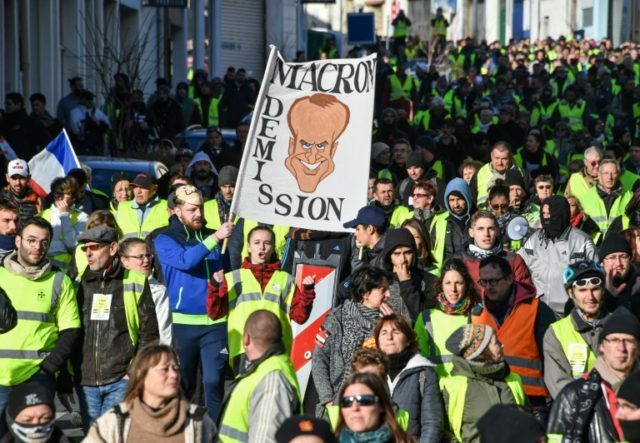 Many “yellow vests” however see the debates as an attempt to drain support from their movement, which erupted in mid-November over fuel taxes but quickly grew into a broader anti-Macron, anti-elites, anti-globalisation revolt. Marie-Helene Guais, a well-dressed 60-year-old marching in Paris, accused the government of “not addressing the real issues”. “What I want is citizen-sponsored referendums so that citizens can repeal laws, oversee spending and recall senior officials or even the president if they want,” she said, echoing one of the protesters top demands. The growing number of demonstrators to suffer serious injuries at the hands of the police has compounded their hostility towards the state. The “Disarm” collective, a local group that campaigns against police violence, has counted 98 cases of serious injuries, including 15 cases of people losing an eye to rubber bullets. Several demonstrators in Paris carried white roses in honour of the injured. The police have pointed to repeated attacks on officers as justification for their sometimes heavy-handed approach. Macron, who had never held office before being elected president, has struggled to find ways to overcome the biggest challenge yet to his presidency. In December, he scrapped the fuel tax increase the sparked the protests by car-dependent rural dwellers. He also unveiled a 10-billion-euro ($11.5-billion) package of wage increases and tax relief for low earners and retirees. But the measures fall short of the mark for the protesters, who are demanding a radical policy shift in favour of low earners, buoyed by opinion polls that show widespread sympathy for their cause. Macron has refused to row back on reforms aimed at making France more competitive, including his cuts to fortune tax on high earners. The 41-year-old former investment banker argues the tax repelled investors but polls show over two-thirds of the French wanting it reinstated.